Looking at the label on most toothpaste, it would seem that you need an advanced degree in biochemistry to decipher the ingredient names.Propylene glycol, sodium bicarbonate, sodium pyrophosphate, anhydrous dicalcium phosphate and dioctyl sodium sulfosuccinate are all listed. Are you sure you want to put this stuff in your mouth? This is one of the few ingredients actually proven to whiten teeth. It is, in essence, a bleach. H.P. is found in the kits dentists can prescribe to bleach your teeth, as well as in over-the-counter bleaching kits. The American Dental Association advises that you should bleach your teeth only under the recommendation and supervision of your dentist. It sounds high-tech, but it's actually nothing more than old-fashioned baking soda. It's function in toothpaste is questioned by the ADA, although some dentists say it can help to remove coffee and food stains from your teeth. It is a mild abrasive, so it scours your teeth, helping to eliminate plaque. And it does make your teeth feel clean and smooth. Other abrasives you'll often find in toothpastes are dicalcium phosphate, kaolin, bentonite, silica and calcium carbonate (chalk). This is the active ingredient normally found in tartar-control toothpaste. It has been shown to prevent the formation of plaque when used regularly. However, once tartar hardens onto your teeth, it can't be removed at home. Only a professional cleaning will get rid of it. This is a widely-used humectant - an ingredient that keeps the toothpaste moist, and prevents the solid and liquid ingredients from separating. 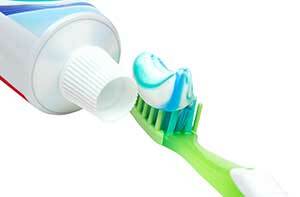 Other common humectants in toothpaste are sorbitol, pentatol and glycerol. This is a detergent-type ingredient that causes toothpaste to foam in your mouth. You may also see ingredients such as sodium stearyl fumarate and sodium lauryl sulfate. Some believe that the latter (SLS) induces canker sores in people sensitive to this ingredient. As with any product, if use causes discomfort, stop using it and consult your dentist or doctor. This is the least-expensive sweetener, so it is the one you are most likely to see in most toothpastes. It is 600 times sweeter than table sugar, so only a small amount is used to sweeten your toothpaste. Other common toothpaste sweeteners are aspartame and ammoniated diglyzzherizins. These are used in toothpastes specially formulated for sensitive teeth. Strontium chloride and potassium nitrate are the two ingredients recognized by the ADA to reduce discomfort if your teeth are sensitive to hot or cold foods. How do they work? They block the transmission of pain to the nerves in your teeth. They don't work immediately - it takes 4-6 weeks for these ingredients to desensitize your teeth. This is an antibacterial agent that was recently approved for use in toothpaste by the FDA. It has been used for years as the active ingredient in antibacterial soaps, lotions, sponges and cutting boards. In toothpaste, triclosan has been clinically proven to fight gingivitis in adults by inhibiting the growth of plaque-causing bacteria. Colgate Total, manufactured and distributed by Colgate-Palmolive Co., is the only toothpaste that currently contains the disinfectant triclosan. Other toothpaste manufacturers are expected to follow suit, but since triclosan is considered a drug, all toothpastes that contain it will have to obtain FDA approval before going on the market.